Without her music, White says her clothing line wouldn’t exist. "When I sit at my computer without music on, I can’t muster any inspiration," she says. "If I need to come up with something new, I’ll go down to the studio for an hour and get inspired," White explains. This then helps her come get into her office and design in an hour what would have taken four hours if she didn't take time to listen to music, she says. Today they have a studio in their basement—really just a room they’re working to soundproof—that functions as the perfect place to lay down tracks, especially after their 4-year-old daughter goes to sleep. They focus on hip-hop and find themselves rapping on a regular basis. "We’ll go down there at least once a week, often several times a week, and plan to be there for 30 minutes," she says, confessing, "then three hours later realize that we lost track of time." "I do better when I design both my collections during the wintertime because I’m doing music at the same time," she says. "It’s never an issue to go down to the studio because I just love it so much. It is always on the forefront of my mind." White finds that her work improves when she is actively doing music on the side—a similar finding to that of the San Francisco State University Study. "I’ve noticed the collections I’ve created while not practicing my hobby didn’t sell as well as the ones when I was practicing," she says. "Sales are usually around 21% higher with collections I created while recording music and interaction with my customers on social media is usually around 14% above average during those times." For Zillow's Rebekah Bastian, a typical day starts by waking up at 6:45 a.m., throwing work clothes into a bag, and heading over to her aerial studio. Her husband takes their sons (ages 3 and 5) to school while she trains for 90 minutes, then goes to work. Bastian leaves by 5 p.m. "I have great work-life balance," she says. "Everyone knows that I leave at 5 p.m. to pick up my kids from daycare," she explains. "We go home, play, have dinner, give the kids a bath," she says, "and sometimes I will jump back on my laptop for an hour to tie things up." 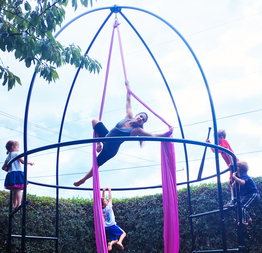 "I invented a 14-foot aerial rig for my backyard," Bastian says. "I’m an engineer by trade, so I had an idea of what I wanted, sketched it out, and hired a metal worker to build it," she says. The rig doubles as a jungle gym and a soccer goal, Bastian observes, "so everyone wins." Bastian’s life as an aerialist and as Zillow’s vice president of product directly impact each other. She often gets ideas for aerial routines while in meetings, and the physical exertion of her workouts helps her focus in the office. "Especially on the days when I train before work, I come into the office with a clearer head and more energy," she says. While she can’t claim to directly link her career success to hanging upside down, Bastian has seen dramatic improvements since she started the hobby. For example, she’s been promoted multiple times from individual contributor to vice president who now leads a team of 50 employees. Her organization has high retention rates and consistently ranks high in employee satisfaction. Bastian started working on the product side of Zillow's Premier Agent business around seven years ago. In the second quarter of 2016, Zillow Group reported record Premier Agent revenue of $147.1 million, according to data furnished by the company.